Last Saturday, I made the mistake of driving through downtown on my way from Northeast to South Minneapolis. The president was at the Target Center, promoting health care reform. It took me a few blocks to remember why I was stuck in a traffic jam, so I wound up turning at the police barricades. There were demonstrators with signs, chanting, but I couldn’t read or hear what about. Later, I bumped into someone who had been there representing Planned Parenthood. She told me that somebody representing just about any contemporary point of view was on hand, Interesting, because that was the feeling I had from seeing and hearing what I did. And the poor stay poor. Marat don’t make us wait anymore. And we don’t care how. 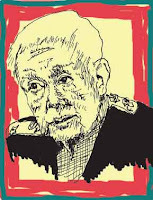 Grace Lee Boggs was on Democracy Now today, while I cleaned the kitchen. Boggs was born in 1915 in Rhode Island, to parents who had immigrated from China. She has a PhD from Bryn Mawr, was married for forty years to James Boggs, an African-American labor organizer, and has organized youth programs, and other community groups in Detroit. Boggs said that we are in a revolutionary and counter-revolutionary period. Revolution, for Boggs, amounts to favoring human relations over economic growth. For Americans, it means redefining what it means for us to be human, and begins with growing our own food. So the revolution is still to come then? great news for us retired hippies! Retirement An Option For Baby Boomers?